Beauty Sketch by Jacq: Lush and Korres Holiday Sets! I guess it is post-Christmas/boxing day sales at Lush made me buy these boxes. The store was doing an 'up to 50% off' on selected holiday products and I grabbed my boxes at both 30% off - quite an amazing deal! I got one Happy Christmas box and another Billy Bonkers Bathtime Favourites. Let's start with the smaller one first. My Happy Christmas box was packed by Dawn's team (well...) and contained 3 ballistics, 2 soaps and 1 bubble bar. This bubble bar is totally the reason I got this box. Never tried bath ballistics/bombs before, these should be cute ones to start with! Not only am I not a regular soap user, these are also really soft and tricky to use! Snowcake smells yummy - but Candy Cane is really not my cup of tea - kind of sickly cherry IMO! 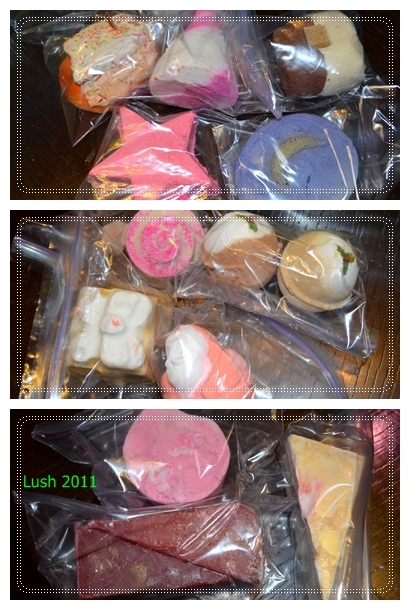 Inside I got 4 bubble bar (yummy), 1 bath melt, 2 bath bombs/ballistic and 1 soap. I will write in the order of my likings - starting with my favourite!!! If you read my Lush Christmas Lust list a while back (HERE), You would have known that this is the key reason I got this box. A bath melt!! Haven't tried this before and I'm genuinely excited. Just by reading its name I feel like my skin is softening (insane?!)~~~! Not sure if its mositure caused it to grow mould?? OMG... I guess I'm cutting that section out - should I? Any Lush soap expert here?? I need a little advice! So a few posts back, I talked about getting myself some Korres from ASOS. I talked about the two skin care samples but totally forgotten to upload and write about the body/hair stuff. Here they are: I got a All I Want set (￡12) and a Best of Korres set (￡14.85). I must admit I have another All I Want set un-pictured, I bought that because it is further reduced to (￡9). So in the All I want set there's 1 body butter, 1 shower gel, 1 shampoo and 1 conditioner. The Japanese Rose Body Butter is the only thing I have opened and tried - the texture is beautiful and the Japanese Rose scent is soft, complex, natural and oriental, as amazing as I have expected! I will give these a review/empties post once I form an opinion on them, or finish them up - whichever the sooner :P These bottles look so cute in my stash really; I don't want to break their sweet little family up!!! !